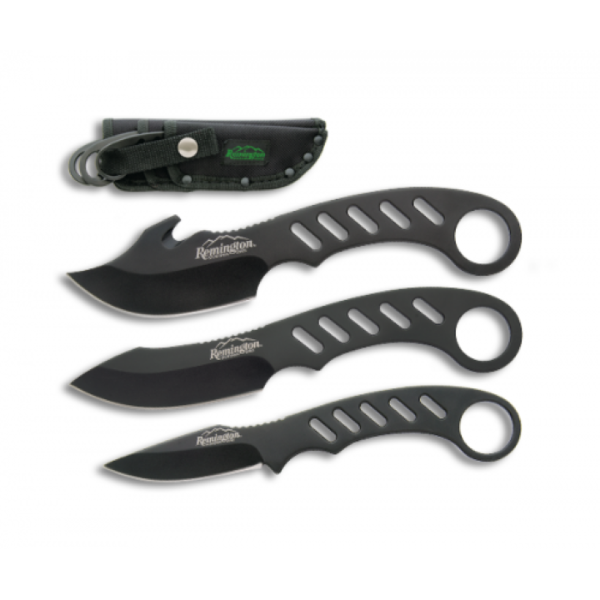 The Remington Cutlery Sportsman Series 3-Piece Big Game Skinner Knife Set is the collection of blades every hunter. The set includes a 7 1/4-inch guthook knife, 7 3/8-inch skinner knife, and 6 1/2-inch caper knife to ensure that you’ll have the right tool when you need it. Each knife is made of 420 stainless steel with a black oxide finish. The black handle includes a finger hole for comfort and features slots for reduced weight. A black ballistic sheath is included to hold and protect the knives when they’re not in use.